HCM City needs to improve energy efficiency and collaborate with international organisations to become a low-carbon and sustainable city, experts told a meeting held in the city on Tuesday. HCM City has implemented many renewable-energy measures, including solar power, in an effort to reduce greenhouse gas emissions. Nguyen Huy Phuong, of the city’s Climate Change Office, said the city, under a new Climate Change Action Plan (2021-25), plans to reduce greenhouse-gas emissions in the fields of construction, energy, transport, industry, water management, agriculture, healthcare and tourism. For example, the city will promote the use of environmentally-friendly buses, including two bus rapid-transit systems, substitute streets lights with LED and solar-powered lights, and use waste from landfills to manufacture organic fertiliser and recycle urban solid wastes. 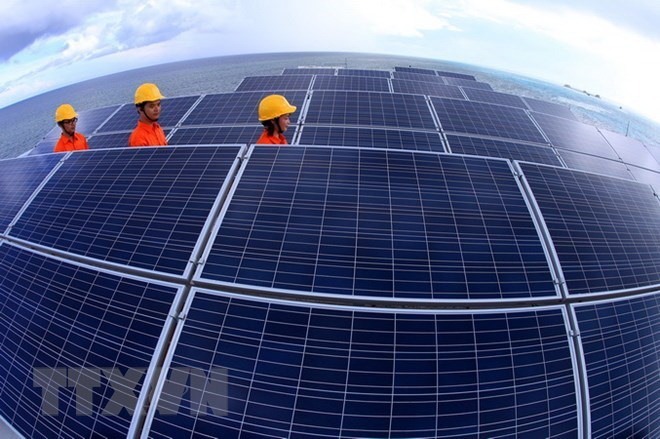 Dr Huynh Ngoc Phuong Mai, director of the city’s Centre for Environmental Technology and Management, said that new policies to promote the use of solar power and renewable energy by businesses and individuals were also needed. Makoto Kato, chief of an emissions-mitigation project managed by Japan International Cooperation Agency’s (JICA) short-term research group, recommended that the city save energy by installing solar panels on high-rises, and use public transport instead of personal vehicles, among others. The JICA project’s “Low Carbon Technology Assessment” report provided a knowledgeable basis for applying technologies in practice, he said. With the city’s strong leadership, best practices and lessons learned from the project will be shared with other municipalities and provinces in Viet Nam, he added. In future policies, the Ministry of Natural Resources and Environment (MONRE) will also reflect the experiences of HCM City to empower non-state stakeholders to implement the Paris Climate Change Agreement. The meeting reviewed the HCM City component of JICA’s project on mitigation actions and the measurement, reporting and verification of greenhouse gas emissions. The JICA project aims to improve the city’s capacity for greenhouse-gas inventory and the use of low-carbon technology in the transport sector. The project has collected and analysed data in the city to identify trends of energy consumption as well as effective policy instruments. The aim is to identify incentives for climate action by learning about efforts of the Tokyo metropolitan government. Since early 2018, under the project, JICA has provided advice to HCM City, one of the cities around the world most affected by climate change. For the Paris Climate Change Agreement, between 2021 and 2030, Viet Nam has committed to reduce 8 per cent of greenhouse gas emissions, or nearly 62 million tonnes of carbon dioxide, with only domestic support, and to cut emissions by 25 per cent with global support in the fields of energy, transport, agriculture and waste. When specific regulations are in place and data collected on emissions, agencies in the country will be obliged to implement measures to reduce greenhouse gas emissions to the permitted levels. Under the greenhouse-gas emission scenario, Viet Nam is expected to emit 400 million tonnes of carbon dioxide by 2018, 500 million tonnes by 2020, 600 million tonnes by 2025, and 800 million tonnes by 2030, according to MONRE. HCM City now emits 38.5 million tonnes of carbon dioxide, accounting for nearly 13 per cent of the country’s total, the ministry said. By 2025, the country wants to reduce greenhouse gas emissions by 45 per cent, increase use of renewable energy to 44 per cent, and increase forest coverage by more than 50 per cent. The ministry has submitted a decree on greenhouse gas emissions to Prime Minister Nguyen Xuan Phuc for approval this year.